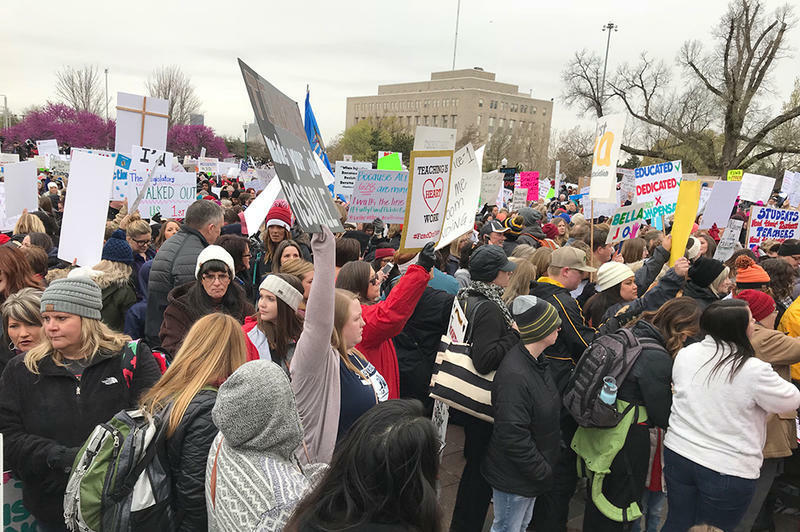 Teachers protested at the Oklahoma Capitol for nine school days. StateImpact Oklahoma's Emily Wendler reports on the Oklahoma Education Association's announcement. "There comes a time, when if what you’re doing is not getting the results you seek, there is wisdom in shifting focus." The union will now turn its focus to 2018 elections, and helping candidates that agree with its education priorities. Priest also said the union does not speak for all teachers in the state, and some may continue the walkout on their own. Another teacher's union, the Oklahoma City chapter of the American Federation of Teachers, announced it will poll members throughout Friday on whether to return to the classroom. Several large school districts—including Norman, Enid, and Putnam City—have said they will reopen schools on Monday, while Tulsa Public Schools announced its teachers will return to work on Monday and classes will resume on Tuesday. Oklahoma City Public Schools, the largest school district in the state, said they will provide information on Friday regarding their participation in the walkout. "They’ve been out for two weeks, and it’s time for them to get back to school. Student learning at schools affected by the strike has been halted for nearly two weeks at a critical time in the academic year when federal and state testing requirements need to be completed." The teacher walkout began April 2, the Monday after Fallin signed the first statewide tax increase in nearly 30 years. The $450 million tax package increased taxes on cigarettes, fuel and oil and gas production and aimed to give teachers a roughly $6,100 raise, as well as raises for school support staff and state employees. By passing that, lawmakers hoped to head off the pending teacher walkout. Shortly before she signed the funding bills, Fallin said she hoped teachers coming to rally at the capitol would thank lawmakers, and then go back to their classrooms. But many teachers said the pay raise package was just a small step after years of funding neglect and they wanted lawmakers to do more. On top of that, just days after lawmakers applauded themselves for passing the historic tax package, they voted to repeal a significant part of it. The repeal of the $5 tax on hotels and motels meant the loss of about $50 million in projected revenue. Over the past two weeks, education leaders have gone back and forth on how much funding they wanted for the classroom and where they wanted the money to come from. At the beginning of the walkout, Oklahoma Education Association officials would not give a specific amount, rather saying they wanted lawmakers to restore a portion of the $200 million that had been cut from school budgets over the past decade. Two days later, on Wednesday, April 4, OEA was pushing for the passage of two pieces of legislation to increase school funding. One was a measure to allow ball and dice games in casinos, another would repeal some capital gains exemptions. Republican leaders remained steadfast throughout the walkout that they would not hear the capital gains exemptions repeal bill. On Friday, April 6, lawmakers passed two bills to fill most of the $50 million hole left from the repeal on the $5 hotel/motel tax. One was the requested 'ball and dice' bill, allowing more table games in casinos and generating an estimated $20 million. The other placed a sales tax on Amazon marketplace vendors, raising an estimated $20.5 million. After their passage, Republican lawmakers warned they would be the last revenue measures heard on their floor. But, hours later, OEA then made two specific demands, both of which seemed to be non-starters. They reiterated their want for lawmakers to pass the bill ending some exemptions on capital gains taxes. The union also now wanted Fallin use a veto to reinstate the $5 hotel/motel tax lawmakers repealed earlier in the week. Doing so would bring in an estimated $147 million annually and, if those demands were met, OEA said they would call off the walkout. On Tuesday, April 10, both demands were ignored. Fallin signed the repeal of the $5 hotel/motel tax and Republican leadership in the House reiterated their desire to not hear the capital gains exemptions repeal in their chamber. Following that rejection, OEA rolled back its demand by almost two-thirds. They said lawmakers just needed to raise another $50 million in revenue in order to call off the walkout. They said it didn't need to be specifically directed to education and they didn't care how that revenue was raised. What followed were two additional days of inaction by legislators and, after nine days of school closures, OEA ended their participation in the teacher walkout.